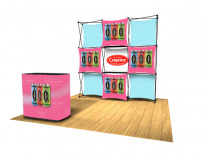 The X Snap Express pop up trade show display Kits grew out of a great idea about saving Optima's customers some money while creating a full 10' portable display. The idea was; "why not offer two of the 1 x 3 stand along frames with graphics, and then create kits that would span the distance between them with shelves and/or other Xpressions graphic skins so it would only cost two thirds of what a normal kit would cost. In addition, all the kits have an attractive case to counter kit with their logo on it as well. What a great idea! 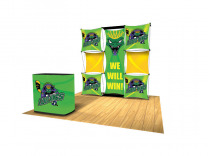 Optima Graphics, who is a supplier of graphics for trade show retailers, delivers their products and services in a unique manner than most. What's the difference? They totally comprehend the big business picture which is to concentrate on the long term success of the business relationship with their customers, while simultaneously focusing on the immediate challenges of the day to day delivery of products and services. 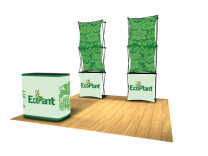 They work tirelessly to be the clear supplier of choice in the trade show display marketplace, by delivering the relationship, first and foremost. They have an ability to consistently deliver above and beyond through great planning, providing information on present issues, and a consistent flow of new products for the future. Years ago, it was Optimas' bold move into the Lambda printing technology which is used in photo murals for pop up displays, that really turned heads in the display industry. Their new products in the pop up displays arena have been extremely innovative, well received in the marketplace, and giant sellers with all their distributors. 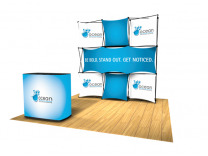 Optima continues to shine above all others in graphic production for the trade show market. In the online trade show display business, the act of truly serving our customers is an important function that can't be overlooked. It's no longer acceptable to just take an order, process it, and move on to the next one. Normally, our clients will be glad to hear what we have to say about the product they're considering purchasing, which ultimately, validates their judgment too. At ShopForExhibits, we're proud to have the experience necessary to truly offer objective advise, and allow our clients to grow from it.